The East Wichel Restricted Parking Zone came into operation on 2nd October 2016. Following introduction of the restrictions residents and visitors raised concerns regarding the availability of parking and the impact this was having on the area. As representatives of the local community the Ward Councillors asked that the current parking provisions be reviewed. The introduction of additional parking spaces on East Wichel Way & other wider roads (61 in total). 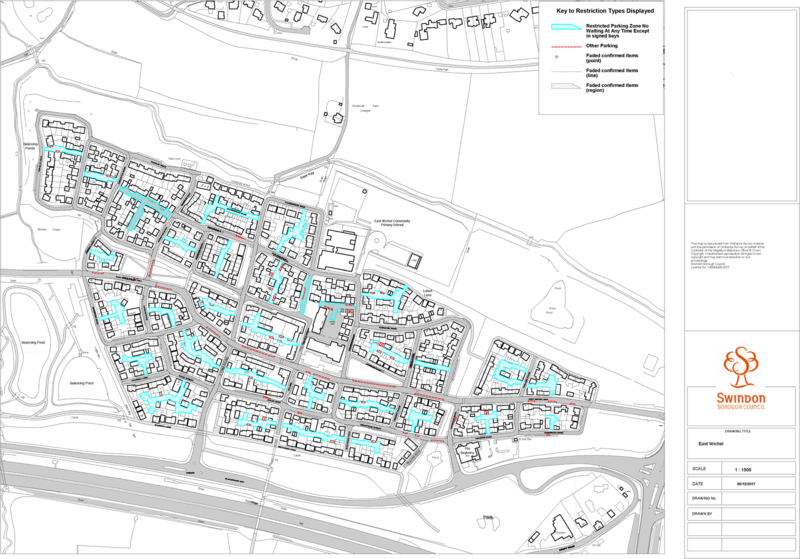 In addition, following updates to the maps of East Wichel, a section of Trevello Road not previously included in the order is now to be included and parking places provided within the Mews areas previously omitted are also to be included. Consultation was carried out with residents in June 2017 regarding a variety of amendments and the proposals are those that the majority of residents supported and Ward Councillors and the Cabinet Member for Economy and Skills have subsequently agreed to take forward. The reason for making this order is to improve the environment for local residents. Consultation on the amendment opens on Friday 9 February, lasts for 21 days and closes on Friday 2nd March. The plan and list of roads are attached. The information is available at www.swindon.gov.uk/trafficregulationorders also at the One Stop Shop at Wat Tyler House, Euclid Street and the East Wichel Community Centre (from 13/2/18). Nadine & Jane would urge residents to take part in this consultation on the parking proposals in East Wichel. Do you still have concerns about how the restricted parking zone will work in practice? Do you think enough new designated parking bays have been identified? Following requests from residents, Nadine & Jane did ask for the top part of Stonehenge Road to have designated parking bays on one side, but this was not taken forward. Some residents will also be disappointed that the issue of larger vehicles parking in East Wichel is not addressed. This was because there are different legal covenants associated with homes in East Wichel, covering appropriate vehicle size, depending on which developer a property was purchased from, so it was felt that this could not be progressed. Any questions, please let Nadine and / or Jane know. Click the plan below to download a PDF version.